See also: Street Trees, Greening Overview and Stormwater Overview. Parking lane planters are landscaped sidewalk extensions placed between parking spaces at regular intervals or at specific locations. They provide space for street trees and landscaping on streets with narrow sidewalks, where tree planting is limited by conflicts with utilities or driveways, or where there is a desire to visually narrow the roadway. Because the roadway subbase is typically 95% compacted, soil improvements should be added to avoid premature tree mortality. Planters should not extend beyond the width of the parking lane; they should be a minimum of 6 feet by 4 feet and meet other guidelines for street trees. Tree canopies should be kept clear of conflict with passing vehicles in the near travel lane; they should be pruned to 14 feet for portions of the tree that overhang the roadway, and meet other guidelines for street trees. Typically, parking lane planters should be separated from the sidewalk curb by a minimum 1 foot break; this gap may be covered by a metal grate or trench drain. Alternatively, parking lane planters may be joined with adjacent sidewalk planters to create more generous tree basins with a continuous body of soil. Trees and planters in the parking lane should be protected from errant drivers by a raised curb, bollard, railing, or other fixed object. 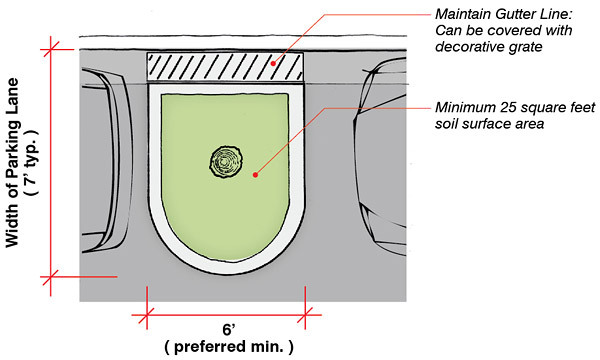 Where in-street planting is designed for stormwater infiltration, the curb may include breaks to allow stormwater to enter and overflow stormwater to exit when the basin is at infiltration capacity. With some exceptions, fronting property owners are responsible for the on-going maintenance and upkeep all sidewalk elements directly fronting their property, such as trees, landscaping, streetscape furnishings and alternative paving materials in the sidewalk. Generally, the City is responsible for maintaining roadway paving and other features in the roadway, such as medians. Typically, if you initiate street or sidewalk improvements, you will be responsible for maintenance of those features. Specific requirements will be described in your permit. Where parking lane planters are designed to treat and/or manage stormwater, applicants should be mindful that parking lane planters are functioning elements of the stormwater infrastructure and must be maintained to serve its required stormwater function. See Stormwater Overview for more information. They present a need for additional hand sweeping of gutter areas between the tree basin curb and the sidewalk curb. They may present difficulties with repairing concrete pavement located between the tree basin and the sidewalk. Where parking lane planters are considered, they should be installed with a plan for maintaining the gutter areas and other areas that street sweepers cannot reach.